"What fun to be a cat!" Here I am with my second post of the day and another entry in the Vandicrafts' Artistry Challenge - Black and White. This one has a Christmas theme. I tried out my Core'dinations Chalk Core cardstock again with the Darice Christmas Tree embossing folder. I sanded it and then added clear glitter to the raised areas. I also added some smoke gray and clear rhinestones. I embellished the corners of my tree panel with some fun little photo corners my friend, Karen Ladd, sent me with a ton of other fun stuff!! (THANKS, Karen!!!) And I even put little gems on them, too. 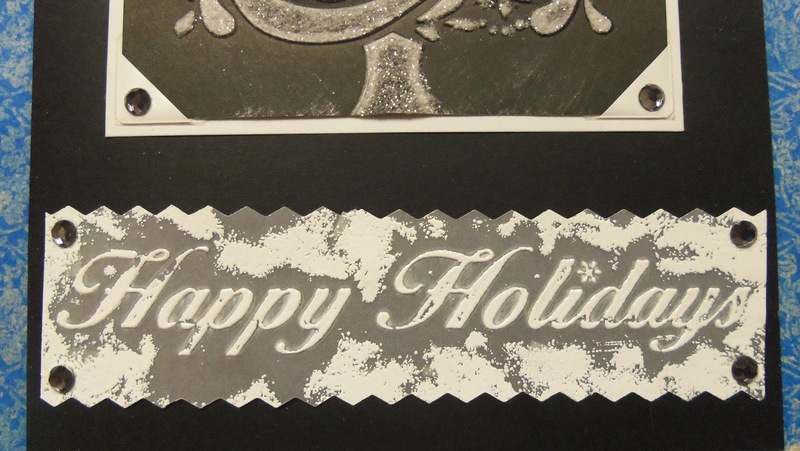 I embossed the greeting on vellum with the Darice Seasonal 3-Pack embossing folders. Then I Versamarked my brayer heavily and rolled it repeatedly over the vellum so areas, besides the words, would be covered and echo the chalkboard effect, somewhat. I heat embossed with that fabulous Wow! Opaque Bright White embossing powder. I like the slightly grunge look that happened. A few more gems and everything mounted on cardstock....and I was done. Hope you enjoyed my card. It was fun trying out the black and white challenge! Thank you, Melissa!!! This one is my favorite out of the two! I love, love, love Christmas so naturally I love the cards associated with it! I love the technique you used to get that grunge effect. Very elegant. Thanks so much, Lauren. I was glad to have an excuse to get my brayer out. I should use it more!! Gorgeous Christmas card!! Great use of your brayer!! Thanks for coming back to play along with the Shopping Our Stash crew for the Rollin' Rollin' Rollin' challenge! Thank you, Donna!!! It was fun using my brayer. I kind of forget about it sometimes. Ooh, you really got into this black and white challenge and the embossing folders on Chalkboard card stock looks amazing! I may have to eventually break down and buy some of those sentiment embossing folders after seeing what you've done with them. So happy to see you found a use for at least 4 of those one hundred photo corners, haha! They frame the main image so nicely and I love that bit of sparkle from the gems. All in all, a very classy and elegant look! Four out of a hundred....lol!! Are there really 100 of them in that pkg??? I doubt that! Holy Cow!! !.....I just checked and there are 280 in there!!! Eeeek. I need to get working on them. Ha!! Seriously, I do love using photo corners and it was fun dressing them up a bit with the gems. Thanks for your sweet comments!!! Beautiful Christmas card, I have a passion for fancy trees at Christmas. Thanks for playing along with us at Shopping Our Stash for the Rollin' challenge. Thank you, Barbara! I had to be rather restrained with my tree since the challenge for Vandicrafts required only black and white. It was a challenge to figure out how to dress up the tree without colors!! You are so sweet!! Thanks for visiting. I hope to get in on some MFP challenges this week or next, too!! such a beUTIFUL tree janis!! thank you for playing along with us at simon says stamp wednesday challenge! Thanks, Jenn!!!! I appreciate your visit and your sweet comment!!! Hehehehe......I have craft equipment/supplies like that, too. Fortunately, I remembered where I had put mine last time I used it!!! Thanks for your nice words!! !